Original, limited edition lino print. Hand-printed with traditional linseed oil ink in 2 shades of soft taupe on heavy 175gsm printing paper. Limited edition of 250 prints. Each print is signed and numbered. Shipping outside the UK: Unframed prints are rolled in sturdy tube and shipped via International Tracked & Signed mail. Shipped by courier to UK addresses only. Frames are made from reclaimed cedar, hand-painted in Old White chalky matt paint. Each frame has its own pattern of knots, dinks, scratches, nail holes, wonky edges and aged patina. Frames are approximately 44 x 55 cms and are fitted with crystal clear acrylic ‘glass’. They come ready to hang. Loving your work... and the one about loving the Sodding Dog more than me! I have just discovered your amazing work and bought five prints! 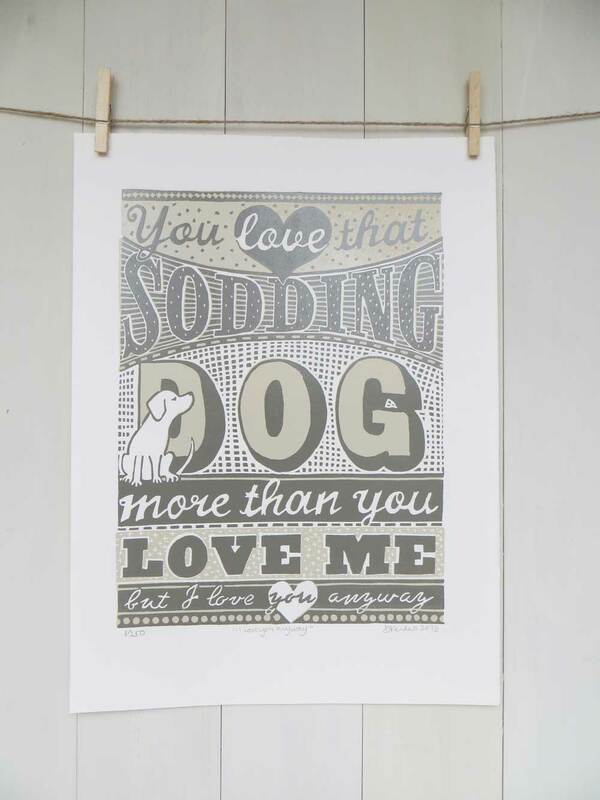 These light-hearted lino prints were inspired by a comment from my husband when I had given our dog (in his opinion) one too many cuddles! 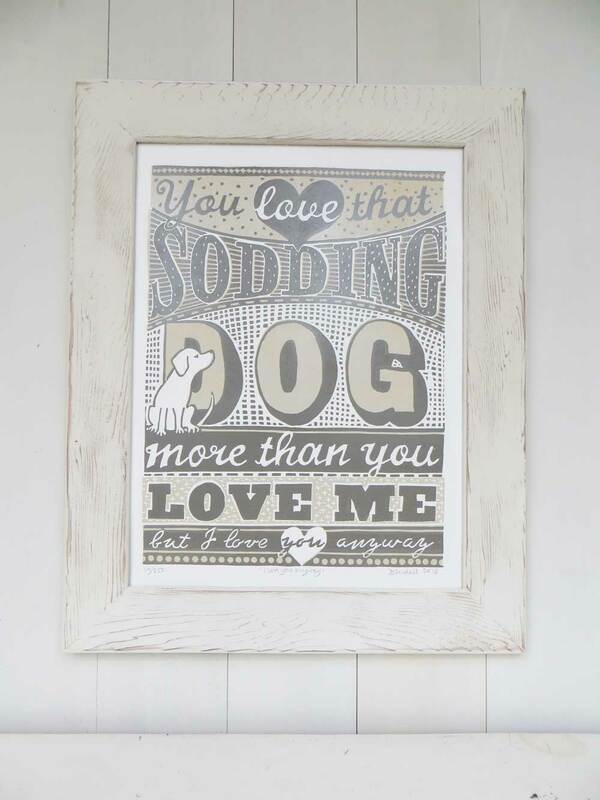 They always raise a wry smile and make a perfect gift for Anniversaries, Birthdays or Valentine’s Day to remind your dog-smitten loved ones how you feel! 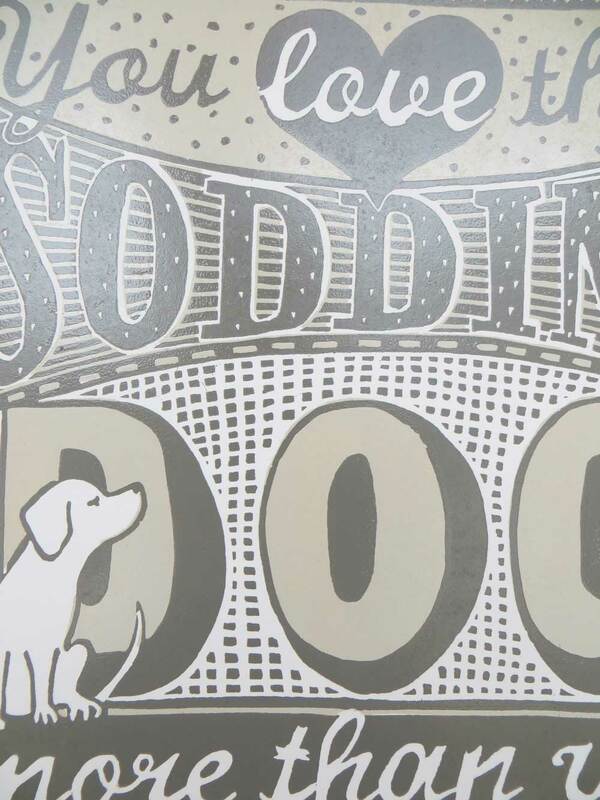 The Sodding Dog design is influenced by original 19th century show posters and fonts. The letters are all hand drawn and hand cut into the lino plates so the prints have a naive, homespun, folk art feel which makes them uniquely personal. The print is also available as a greeting card.